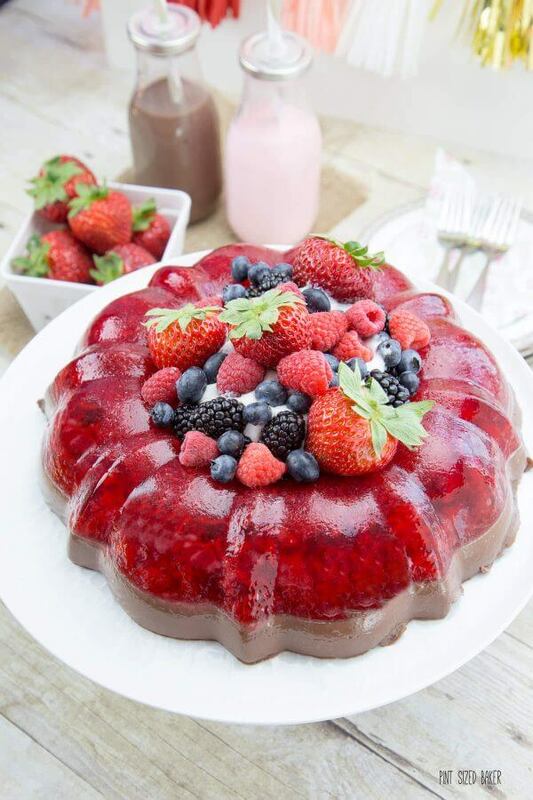 You won’t find any funky meat, cheese, or veggies in this stunning Strawberry and Chocolate Jello Mold. It’s not like Grandma used to make! 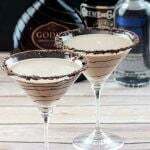 Recently, I was approached to create a “Party like it’s 1965” retro recipe. Of course, the first thing that popped into my head was a jello mold recipe. The ladies were crazy about their jello molds and came up with some pretty interesting combinations. I wanted to go for something beautiful to serve and delicious to eat. 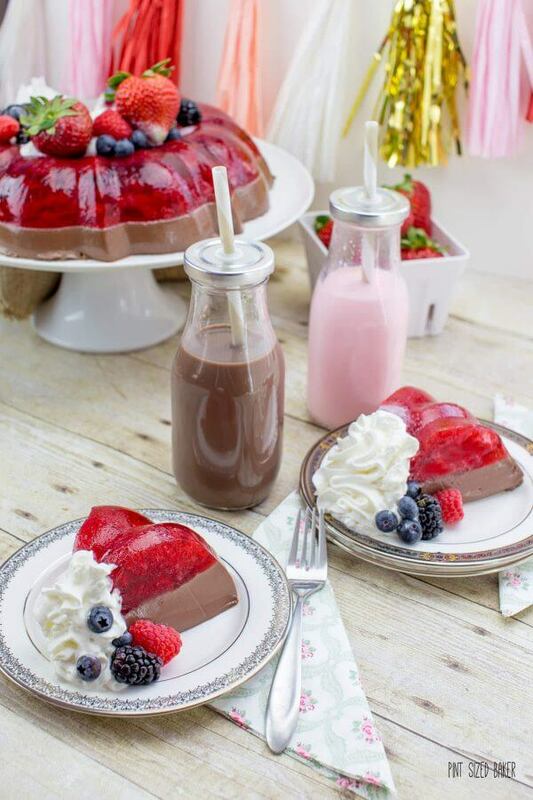 Enter this Strawberry and Chocolate Jello Mold dessert. 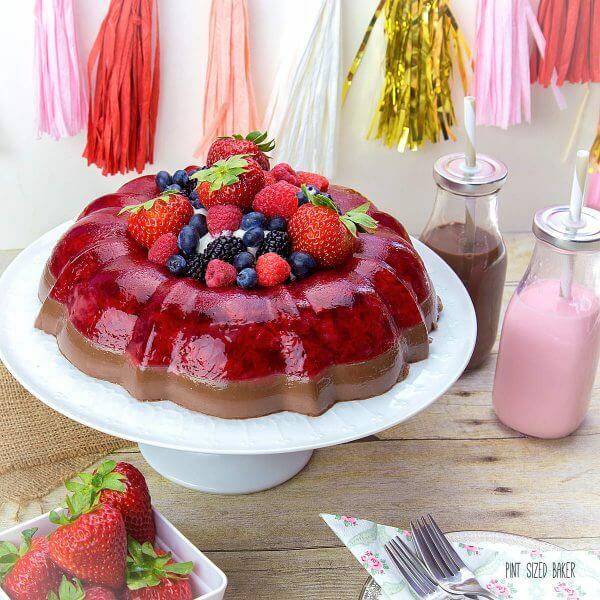 From the bright strawberry jello made with a pint of fresh strawberries to the chocolate jello base, this dessert is sure to turn a few heads at your summer party. This dessert just screams to be made! Get a large, 12 cup bundt pan to make this dessert. OF course, you can always find some real Tupperware Jello Molds, but the ones I found were only 6 cups and this recipe made 9, so plan according. 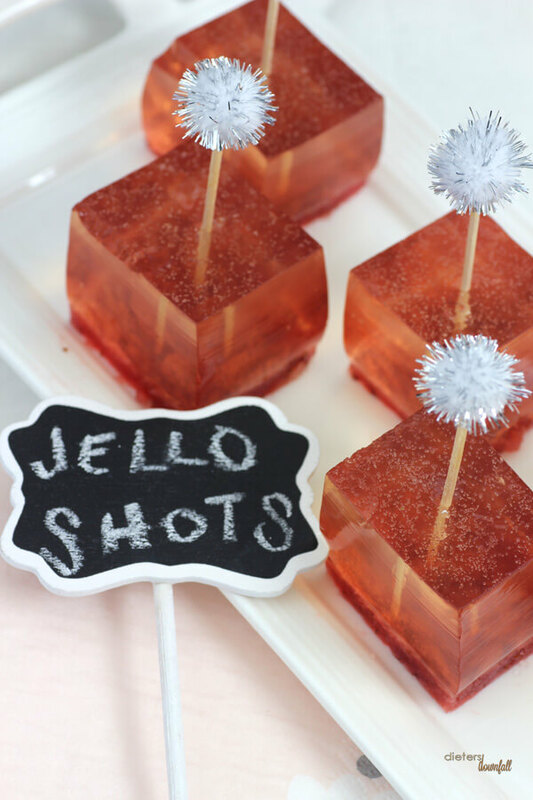 Bring back the popular Jello Mold for your summer PARTY! 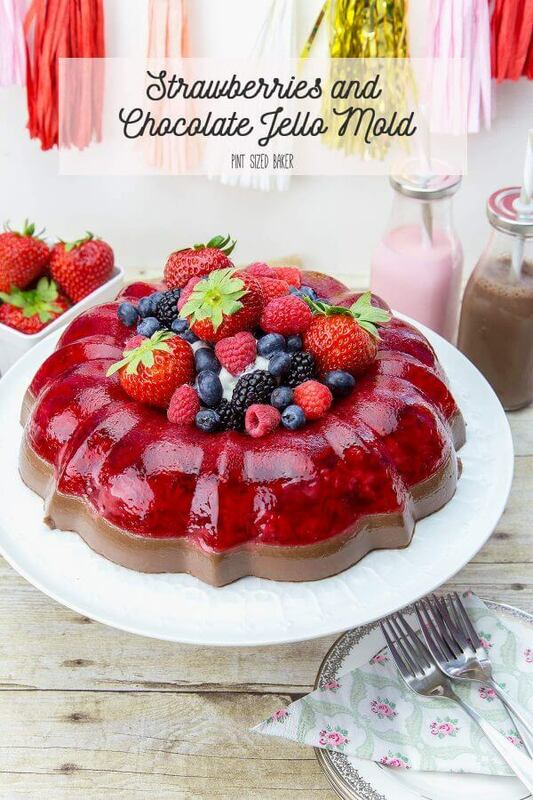 This Strawberry and Chocolate Jello Mold is beautiful to serve to your guests. Wash, hull, and quarter the strawberries. Place into a pot with ½ cup water and ¼ cup sugar. Cook over medium high heat until strawberries are soft and easily squished, approximately 10 minutes. Use a potato masher or fork to completely mash the strawberries to a pulp. You should have 1 cup of strawberry puree. Set aside. Sprinkle the packet of gelatin over ½ cup of water and let it absorb for two minutes. Pour the mixture into the hot strawberry puree and add enough water to bring it to two cups. Make your strawberry jello according to the directions on the box. 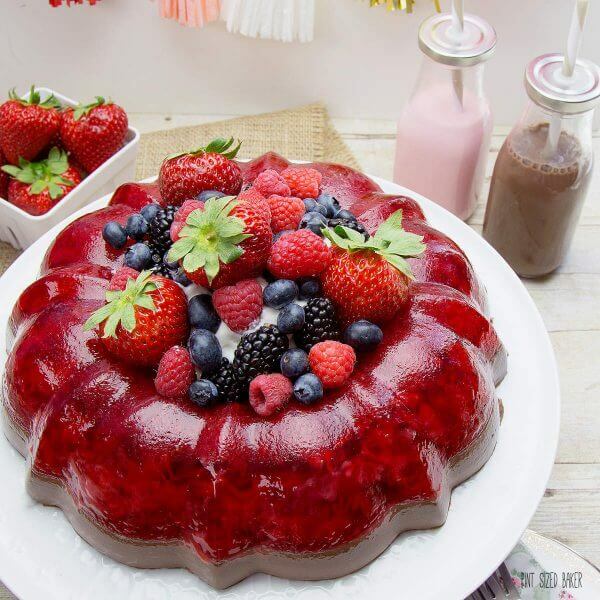 Mix the boxed jello with the pureed strawberry jello (now 4 cups total) and pour it into a large bundt pan. Refrigerate for 1 hour. 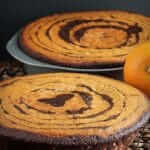 Whisk together the milk, cocoa powder sugar and vanilla. Bring just to a boil like you're making hot chocolate. Sprinkle the gelatin over the water and allow 2 minutes for it to fully absorb. Add to the hot milk mixture, stir and then cool on the counter until the strawberry jello is set, or at least 330 minutes. Pour over the strawberry jello in the the bundt pan and refrigerate overnight. To release the mold, fill your sink with warm/hot water. Dip your bundt pan into the water for 1 minute. Carefully pull the edges away from the pan so that they are not sticking. Place your serving tray over the top of the bundt pan, then flip it over. Give the bundt pan a little shake to help release the mold. 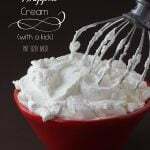 Serve with 1 cup sweetened whipped cream and fresh berries. 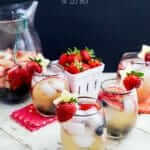 Are you already planning a few summer get together’s with friends? I remember when I was kid, my mom would take us to my grandparents place on Lake Erie in Canada and they would throw big picnic parties and there would be no less than three different jello salads brought by friends and neighbors. The jello salads were usually green or pink and while most had fruit cocktail added to them, some had ricotta cheese and others had milk or cream added to them. Thank goodness that by the 1980’s, most people had stopped adding meat, cheese, or veggies to their gelatin molds. UGH! Throwback jello molds from the 50’s and 60’s are more like throw-up jello molds. Don’t believe me – just google “1950 jello mold recipes” and look at the images. OMG! Horrendous! But your totally safe with this recipe. Trust me. 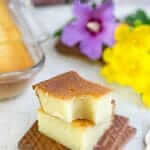 I served this fun dessert with the choice of strawberry milk or chocolate milk. 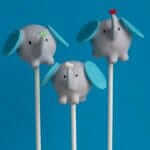 Isn’t that just so cute? I love my little milk bottles. (Got them at Target in the Dollar Spot!) Decorate with the fun tassel banner and loads of fresh berries and you’ve got your dessert covered for your party. What’s even better, is that you can make this the day before your party so that you have all day to get your yard in order for the festivities. Now are you ready to throw a party? Better Homes & Gardens is here to help get your party planed! Better Homes & Gardens wants you to check out their new party magazine called “Get Together” where they will help you plan your very own retro throwback party, a puppy party or just a casual Alfresco get-together. It’s packed full of great party suggestions like a crawfish boil, a chocolate tasting party, backyard movie night, or a spa party. And if you are planning a spa party, can I, pretty please, get an invite? BH&G has all the great food recipes, drink recipes, DIY invitations and crafts, and so much MORE! I loved pouring through the pages and wanting just about everything in the magazine. Pick up your copy of the Better Homes & Garden special issue “Get Together” at your local news stands or order it online HERE. You can also score some free printable recipe cards at Better Homes & Gardens and send your friends off with recipe cards of the delicious food served. Good times and great memories are made during the summer. Disclaimer- This post was done in collaboration with Better Homes & Garden. 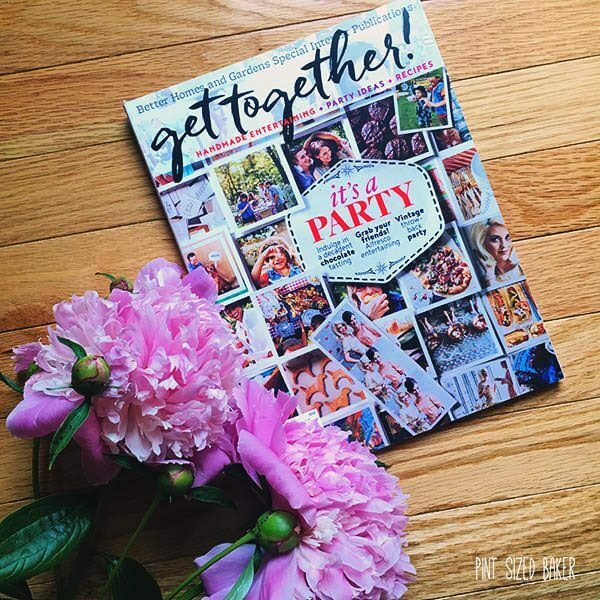 I was sent me a free copy of their “Get Together” publication along with some recipe cards in a fun #BHGParty package. Check out Instagram, and follow all the great posts. Jello molds never go out of style!! oh, and this is absolutely gorgeous looking! Oh this reminds me of my mom. She always made jello molds (not as gorgeous as this one) but I always loved them! I do remember some of the versions of Jell-o you mention. I think it was just two particular friends of my parents that would have parties and would always have some sort of a mold and they didn’t look nearly as pretty as yours! Love this flavor combo!!! My intention was to remake one of “those jellos” but I just couldn’t. They just needed to stay in the 60’s. I’m not usually a jello fan, but I might have to make an exception for your strawberry chocolate jello mold. 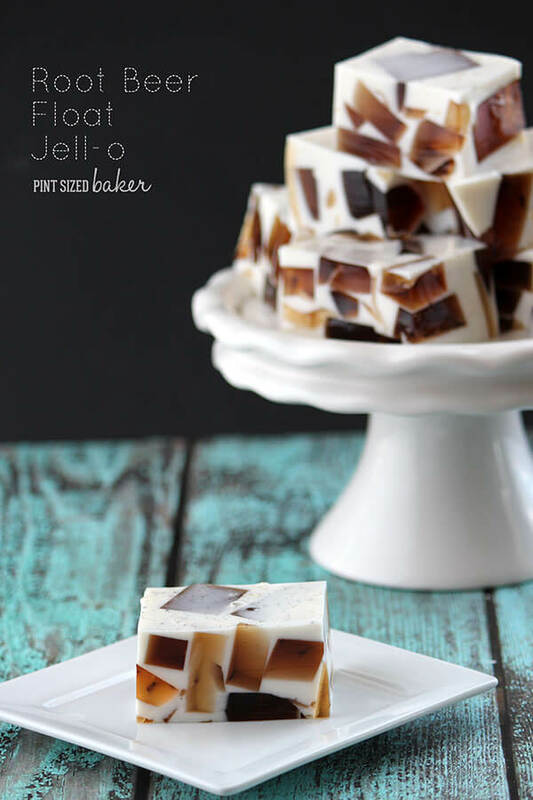 I’ve never seen chocolate jello, and now I’m really intrigued. 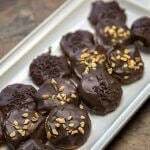 The chocolate is pretty much hot chocolate with gelatin added to it. It’s a bit strange your first bite because your mouth isn’t expecting something to “eat”. lol. But it’s really good! Fruit jello is a favorite of mine too. My kid however, hates fruit in her jello. I got a weird kid! Looks so cool! 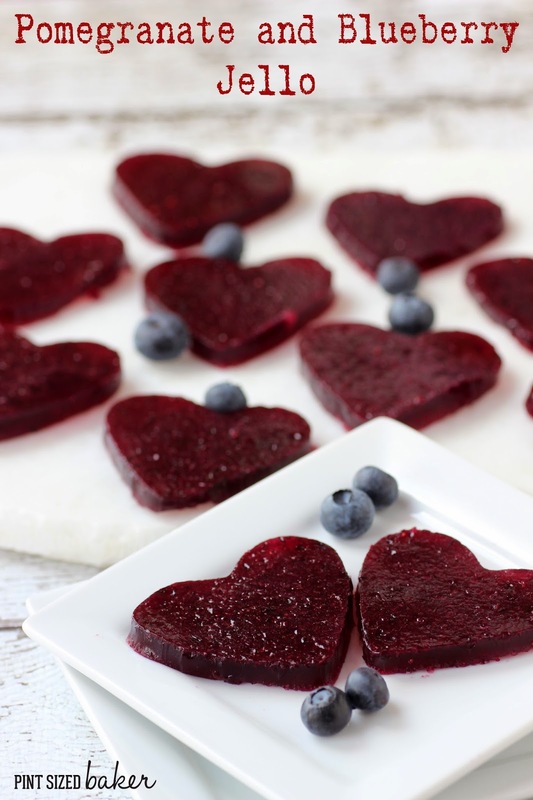 Love jello! 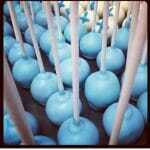 Pinning to try it!